Delaware Water Gap, Pennsylvania is also a town located near the gap. The Delaware Water Gap is a water gap on the border of the U.S. states of New Jersey and Pennsylvania where the Delaware River cuts through a large ridge of the Appalachian Mountains. The gap constitutes the southern portion of the Delaware Water Gap National Recreation Area, which is used primarily for recreational purposes, such as rafting, canoeing, swimming, fishing, hiking, and rock climbing. A water gap is a geological feature where a river cuts through a mountain ridge. The Delaware Water Gap began to form 500 million years ago when quartz pebbles from mountains in the area were deposited in a shallow sea. The Martinsburg Shale on the eastern side of what was to be Kittatinny Mountain was uplifted 450 million years ago when a chain of volcanic islands collided with proto-North America. These islands slid over the North American plate, and deposited rock on top of plate, forming the Highlands and Kittatinny Valley. About 400 million years ago, a small, narrow continent collided with proto-North America. The heat from the pressure melted the quartzite, which allowed it to bend the quartz pebbles and Silurian Shawangunk Conglomerate. This layer was then uplifted and cracked over thousands of years. During this period, the Delaware River slowly cut its path down through the shattered and cracked quartzite. If the quartzite had not been cracked, the river would not have been able to cut its path through the mountain to form the gap. Millions of years of rain, ice, snow, and wind erosion shaped the area. The Wisconsin glaciation, which occurred between 21,000 B.C. and 13,000 B.C., covered the entire Kittatinny Ridge and ended near Belvidere. When the glaciers retreated, the gap which was already there assumed its present form. The mountain consists of Silurian Shawangunk conglomerate. This is gray quartzite, which makes the mountain highly resistant to weathering. The Silurian High Fall formation of sandstone is on the western side of the gap near the base. The eastern side of the gap has Ordovician Martinsburg shale. Sedimentary rock is along the river. The Bloomsburg Red Beds, a red shale, are at the gap under Dunsfield Creek. The Delaware Water Gap is about 300 meters across at river level and 1,400 meters wide at the top. The river through the gap is 283 feet above sea level. The ridge of the Appalachians that the Delaware crosses is called the Blue Mountains in Pennsylvania and the Kittatinny Ridge in New Jersey. This is the first major ridge of the Appalachian mountains. 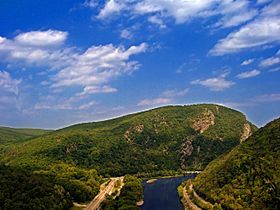 The New Jersey mountain is Mount Tammany, named after the Native American Chief Tamanend. 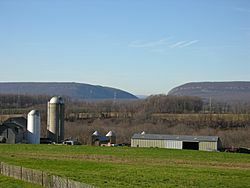 The Pennsylvania mountain is Mount Minsi, named after the Native American tribe of the area. The summit of Tammany is 1,540 ft (470 m) above sea level. A northern deciduous forest cloaks the slopes of the Delaware Water Gap. Hardwood species comprising the forest include various oaks, hickories, maples, ash, elm, cherry, walnut, birch, sycamore, and beech. Coniferous species include Eastern White Pine, Pitch Pine, Eastern Red Cedar, and Eastern Hemlock. Black bear, whitetailed deer, gray squirrels, red squirrels, raccoons, gray fox, fisher, and chipmunks are some of the forest species of the area. Shad migrate up the river through the gap in the spring. Other fish include bass, trout, carp, and walleye. Timber rattlesnakes and copperheads also inhabit the rocky areas of the mountain. Salamanders are found in the moist areas of the forest. Eastern Prickly Pear Cactus also grows on the mountain near the red dot trail on the south eastern facing slope halfway up the mountain. Foot travel was not possible through the Gap on the New Jersey side or Pennsylvania side as steep rock walls went into the river. In 1793 a road was built on the Pennsylvania side of the river. In 1830 a road was built on the New Jersey side through the Gap and north toward Pahaquarry. Interstate 80 passes through the gap on the New Jersey side as of the early 1970s via the Delaware Water Gap Toll Bridge. The Pennsylvania portion of the New Jersey Cut-Off mainline of the Delaware, Lackawanna and Western Railroad comes into Slateford, PA. The Pennsylvania Northeast Regional Rail Authority owns the trackage in the Water Gap area and is operated by the Delaware-Lackawanna Railroad. Pennsylvania Route 611, which is adjacent to the railroad for most of way through the Gap, occupies the right-of-way of a former trolley line. Interstate 80 occupies the former right-of-way of the New York, Susquehanna and Western Railway. In 1962, Congress authorized the building of a dam across the Delaware River at Tocks Island, upstream of the water gap. Meant to control hurricane-related flooding, it was never built. The land for the proposed reservoir, which had already been purchased, was used to create the Delaware Water Gap National Recreation Area in 1965. There are two visitor centers, one in New Jersey near the Delaware River bridge and the other in Dingman's Ferry, Pennsylvania. Headquarters is located on River Road in Pennsylvania. The New Jersey side of the gap is also protected within Worthington State Forest, a New Jersey State Forest wholly contained within the recreation area. The Red Dot Trail is a path to the top of the Kittatinny Ridge, which has views of the entire area. This is roughly a one-hour hike, traversing over 600 vertical feet. The red dot trail is highly eroded due to weather and large numbers of hikers. The Gray Dot Trail is a very steep climber's trail that goes from I-80 to the top of the gap along the top edge of the big wall. The trail has shale and rocks which make hiking very difficult. The gray dot trail is poorly marked. This trail intersects with the blue dot and red dot trail at the top. The hike up the gray dot trail and down the red dot trail takes about two hours and fifteen minutes. The blue dot also goes to the top, but is about a 3-mile hike that is less steep than the red dot. 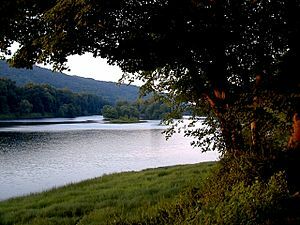 The Appalachian Trail crosses the Delaware River on the Route 80 Bridge and goes up Dunfield Creek to Sunfish Pond and continues northeast to Stokes State Forest. The trail crosses Route 206 and continues along the top of Kittatinny Mountain to High Point State Park where the trail turns east and eventually goes into New York State. This part of the Appalachian Trail is maintained by the New York - New Jersey Trail Conference hiking club. The Gap is a popular place to rock-climb in New Jersey. The climbs are one hundred fifty feet (50 meters) to three hundred feet (100 meters), climbing on Silurian Shawagunk conglomerate, which is quartzite, with bands of shale from a half inch to four inches thick. Most climbing is done on the New Jersey side due to easier access. There are about one hundred climbs on the New Jersey side. Climbs range form 5.1 to 5.14 on the Yosemite scale. Climbers follow the gray dot trail along route 80, then passing the large rock face on route 80. They then go up the path to the route they choose. In recent years, the Pennsylvania side has been closed to climbing during the nesting season for peregrine falcons; this has resulted in overgrowth of trails and climbing routes, providing an experience closer to the natural state than is found at more popular climbing destinations. The Easton Area Council of the Boy Scouts of America operated Weygadt Scout Reservation in the Delaware Water Gap at the base of Mount Tammany from 1931 until 1968. The Reservation was originally home to two Scout camps—the Easton Council's Camp Weygadt on the southern part of the reservation and the Bethlehem Area Council's Camp Minsi on the northern section of the reservation. In the later part of the 1930s, the Bethlehem Council moved their camp to the Poconos, and the entire reservation in the Water Gap became Camp Weygadt. Camp Minsi is now located in Pocono Summit, Pennsylvania, on the shores of Stillwater Lake. Pahaquarra Boy Scout Camp was located on the New Jersey side of the Delaware Water Gap on Old Mine Road at the abandoned Pahaquarry Copper Mine. The camp served Boy Scouts from the George Washington Council. Just north of this camp was Camp Cowaw Boy Scout Camp which served Raritan Council Boy Scouts. Delaware Water Gap Facts for Kids. Kiddle Encyclopedia.